In America, poverty and poor nutrition often go hand in hand. That's also true for the cash-strapped nonprofit organizations that support the developmentally disabled, say Jim and Sylvia Vail, both 1980 Kellogg graduates. Struggling under budgetary constraints, ineffective accountability measures and limited knowledge of preventive health, many social service agencies are feeding low-quality, high-caloric foods to the people they support. The obesity rate for the 6 million people with developmental disabilities is three times that of the mainstream population, and related health problems are unnecessarily costing taxpayers $4,000 per person, per year. Enter Jim and Sylvia's brainchild Mainstay, which provides products and services to help with this dilemma. Through customized software and a "train the trainer" approach, Mainstay (eMainstay.com) addresses both the individual and the organization. Participating social service providers receive tailored resources to help them plan and prepare tasty, nutritious and economical meals. In fact, under Mainstay's guidelines for healthier eating, breakfast, lunch, dinner, snacks and beverages cost less than $3 per person, per day. According to Jim, organizations that use Mainstay's products cut their food costs by 10 to 20 percent within six months. At the same time, residents become engaged in the meal process, experience an average weight loss of 10 to 15 pounds, and significantly decrease their medication usage. Providers can also track, trend and forecast health-related outcomes for the people they support, and measure their effect on funding streams, taxpayer expense and the organization's bottom line. Based on those results, Mainstay has set a goal of helping the developmentally disabled population lose 5 million pounds within three to five years — and to help the organizations that support them save $50 million over the same period. Neither Jim nor Sylvia had a background in nutrition when they launched Mainstay as a prepared-foods delivery business in the 1990s. 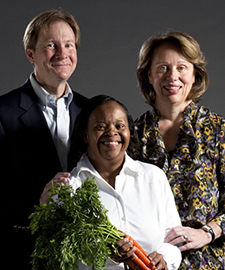 The couple's motivation for starting Mainstay was entrepreneurial: They noted that there was a need for healthy, economical meals in communal homes that served the developmentally disabled. In 2000, the Vails felt compelled to redirect their efforts toward solving critical, financial and preventive health problems. They began focusing more on strategic, measurement-based initiatives for the developmentally disabled, social service agencies and the broader system. The couple was recently asked to work in conjunction with the U.S. Department of Agriculture to expand Mainstay's impact throughout the United States. They have been instrumental in enacting legislation to mandate healthy body-mass indices for people living in group homes, and will soon meet with the U.S. Secretary of Health and Human Services to discuss ways to bolster the Medicaid system. While the Vails feel good about their progress thus far, they caution that there is still work to be done. "Mainstay has created a lot of positive momentum, but this is a horrendous problem that continues to be extremely costly in terms of lives and money," Sylvia says. Adds Jim: "There's a long way to go, but I'm glad we've started to make an impact — pound by pound and dollar by dollar." Go to "Clean and green"